Travel along Ipswich Road until you get to the Warwick Exit. 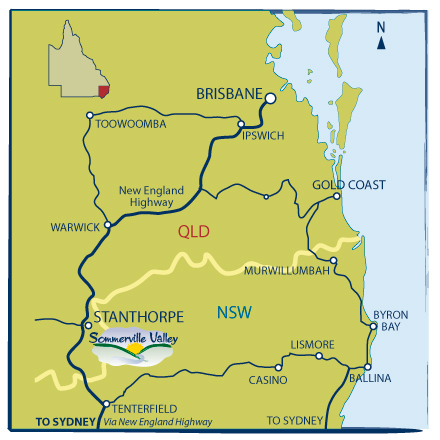 Take the Warwick Exit, follow the directions to Stanthorpe. Please refer to map 1 [click left on icon] for more details. Travel up the coast road to Ballina, then cross over to the New England Highway. Follow the directions to Tenterfield and when you get to Ballandean, turn right onto Eukey Road. Stay on Eukey Road until you come to Pyramids Road, turn right, then left onto Nielsens Road and follow until you come to Sommerville Lane. Please refer to map1 [click left on icon] for more details. Drive through Stanthorpe. Take Sugarloaf Road (off Wallangarra Road) out of town. Stay on Sugarloaf Road until you come to Nielsens Road. 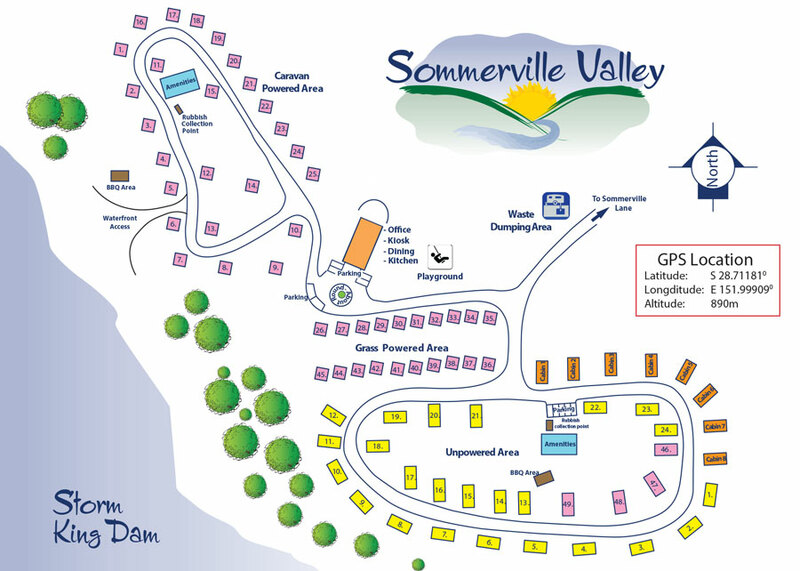 Turn right and then right again onto Sommerville Lane. Please refer to map 2 [click left on icon] for more details. Please refer to map 3 [click left on icon] for more details. Storm King Dam rests in a picturesque rural setting with many water birds and is an ideal spot for picnics, water sport and fishing. Fish species include Golden Perch, Murray cod, Silver Perch, Jew and River Black fish. Storm King Dam is a stocked dam. Fishing permits are available online or at any Post Office. Please note Stanthorpe Post Office is not open on a weekend. No boating restrictions apply, however a permit is required for powerboats (at no cost). Contact Southern Downs Regional Council to obtain a permit. 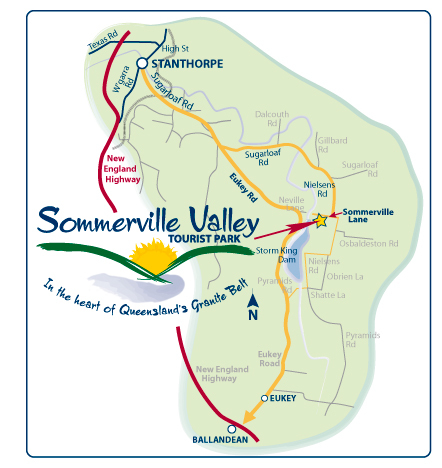 Address: 63 Sommerville Lane, Stanthorpe Qld, Australia. Travel along Ipswich Road until you get to the Warwick Exit. Take the Warwick Exit, follow the directions to Stanthorpe. Please refer to map 1 [click left on icon] for more details. Please refer to map1 [click here] for more details. Please refer to map 2 [click on icon] for map. Please refer to map 3 [click icon] for map. Storm King Dam rests in a picturesque rural setting with many water birds and is an ideal spot for picnics, water sport and fishing. Fish species include Golden Perch, Murray cod, Silver Perch, Jew and River Black fish. Storm King Dam is a stocked dam. Fishing permits are available online or at any Post Office. Please note Stanthorpe Post Office is not open on a weekend.